Back from S.F and L.A. So I just got back from a two-week trip to California. The first few days were in San Francisco, where my wife was attending the Game Developer’s Conference. I spent the days wandering about, reading World War Z, and seeing friends, which was nice and relaxing. On Friday, March 27, I went to the Cartoon Art Museum, which had some great Stan Sakai (Usagi Yojimbo) and Watchmen exhibits. Nice to see some comic art museums out there since my local one, the Words and Pictures museum in Northampton, MA, closed several years back. We spent the evenings getting caught up on the last 3 episodes of Battlestar Galactica, and I have to say I enjoyed it (and this whole last season) quite a bit, despite not having been sucked into the show as a whole as much as everyone else. I think, in general, it was just a tad too dark and overly-complicated for my tastes. But it ended well. On Saturday, March 28, we hit Alcatraz, which was awesome, especially since I wanted to get some inspiration for a future jailbreak story I’m toying with. From March 29 to April 7, I visited my brother in L.A., where I watched a lot more TV and ate a lot more food than I should have. For lunch one day, I visited David Schwartz (the writer of the Image Comics series Meltdown) at the Disney/ABC studio lot in Burbank. 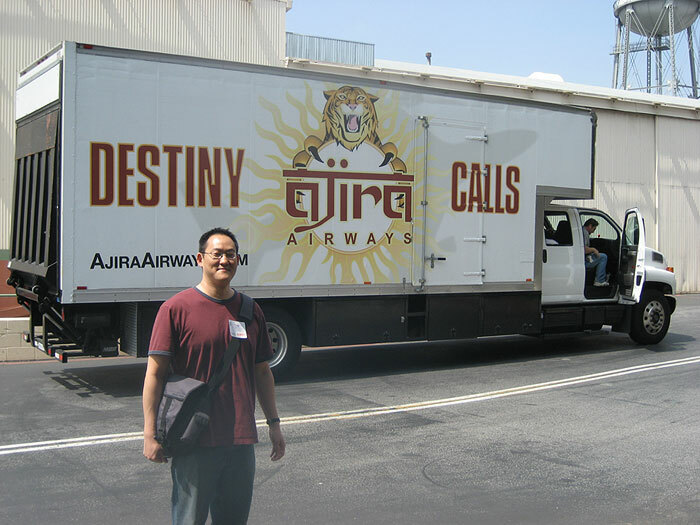 While I was there, I snapped a cool picture of an Ajira Airways truck (from Lost) on the lot. One night in L.A., I got together with some cousins and a friends for a night of figure drawing. A couple of them are sculptors but like to keep their drawing skills fresh by doing private figure drawing sessions with a live model. That was pretty great since it has been a while since I’ve done any kind of life drawing. Had to fight the urge to add alien squid legs to every pose. Finally, we went to LEGOland in San Diego this past weekend, which was amazing. The park consists mostly of rides and playgrounds for little ones (kids, not hobbits, although they’d probably enjoy it too), but in the center of the park, there is a “Mini-Land” that’s full of LEGO miniature versions of various cities, like NY, Las Vegas, New Orleans, etc. This was by far the coolest part of LEGOland for me, possibly because it appeals to my interest in architectural model-making, but most likely because it made me want to go Godzilla on all of it. At the LEGOland gift shop, I finally got the see the LEGO Ultimate Collector Millennium Falcon in person, which is much bigger than I expected. Expensive too. But damn, I want that thing. Anyway, that was my trip. Now it’s back to work…after I check eBay for that LEGO Falcon.